KEEP CALM AND CARRY ON: Are you a good fan? Are you a good fan? Last night I went to my first Monday Night Football game - the Bengals vs. Steelers! I got tickets for my Dad and I to go together for one of his wedding gifts when me and Billy got married back in August. Growing up he was a big fan of the Bengals and this continued on with me! (Who Dey!) I figured this would be great father daughter bonding time and we sort of despise the Steelers so I was really hoping the Bengals could get a big WIN against them!! Unfortunately, the Bengals lost 27-21, but I had so much fun and am really glad we went and I got to experience it with my Dad. The game really got me thinking about what a good, loyal fan means. The fans sitting around us were very interesting to say the least.....people watching at it's BEST! We had a big group of Steelers fans a couple rows behind us, a drunk obnoxious Bengals man 2 rows in front of us, and a couple directly in front of us that were Steelers fans. From the beginning of the game, the Steelers fans in front of us and the drunk Bengals man were already going at it with their words. "Bleeeepppp... Bleeeeppppppp....Bleeeeeepppp....*%$#!" I don't think I've heard that many cuss words in a matter of 5 minutes. Now I understand being at a Monday Night football game that it's going to be intense but is it really necessary to curse EVERY OTHER WORD?! It gets really old, really quick. I admit I can have a foul mouth at times... I am guilty as well in the heat of the moment (who isn't?)... but from now I am really going to try to refrain myself, especially when at a game in public! It's one thing if you are yelling obscenities in your own home....by yourself....at your TV (finger may be pointing at myself here hehe) but when you are in public and families are around it's just uncalled for. Anyways, the couple in front of us started standing the entire game (even when no one else was standing) and there was nothing going on at the time and it became obvious they were doing it on purpose just to block our view. Come on people... do you have to stoop that low? Whatever happened to respecting others? Moving along - Billy and I usually go over to my parents house for dinner every other Sunday or so, but I was too tired from my soccer games to make it over there yesterday. I was soo happy when I walked into work and was greeted with a giant tupperware container full of homemade tortilla soup, tortilla strips, and beer bread!!! YUMM-O! 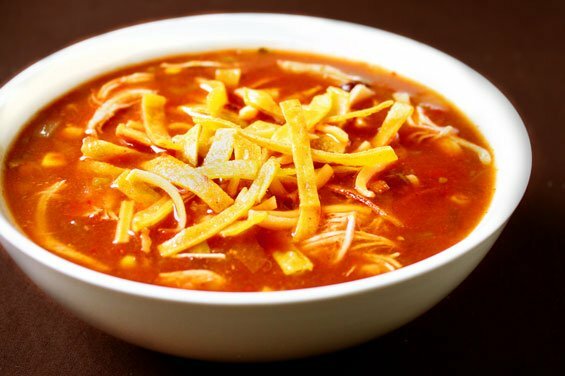 My stepmom makes the best homemade tortilla soup so I thought I would share the recipe with you all... it may not be the healthiest recipe but it's delicious, easy, and a perfect fall lunch or dinner meal!! In a large stockpot combine and whisk together until smooth all 8 cans of soup. Add chicken broth. Add tomatoes, salsa, green chiles, onion, garlic, chili powder, salt and pepper. Bring all ingredients to a full boil, reduce heat, and simmer for 1 hour. Add cilantro and chicken breast chunks. Simmer another hour. While soup is simmering, make your soup toppings. Cut flour tortillas into small thin strips and deep fry in hot oil until lightly browned. Shred cheese. That soup look amazing! I am a big Bengals fan too! Cute blog! :) I am going to have to try this recipe! I LOVE chicken tortilla soup!